2017 Family Fun Fitness Day – Tender Hearts Inc. The Fitness Challenge is a partner challenge aimed at testing your physical strength, endurance, coordination and cooperative strategy. Testing your basic functional capabilities as human beings while challenging you to work with a friend or family member in a way that you can maximize both of your own personal potential, for the greater team effort! All levels and ages are welcome, come test your fitness in a fun and welcoming family environment for a great cause! 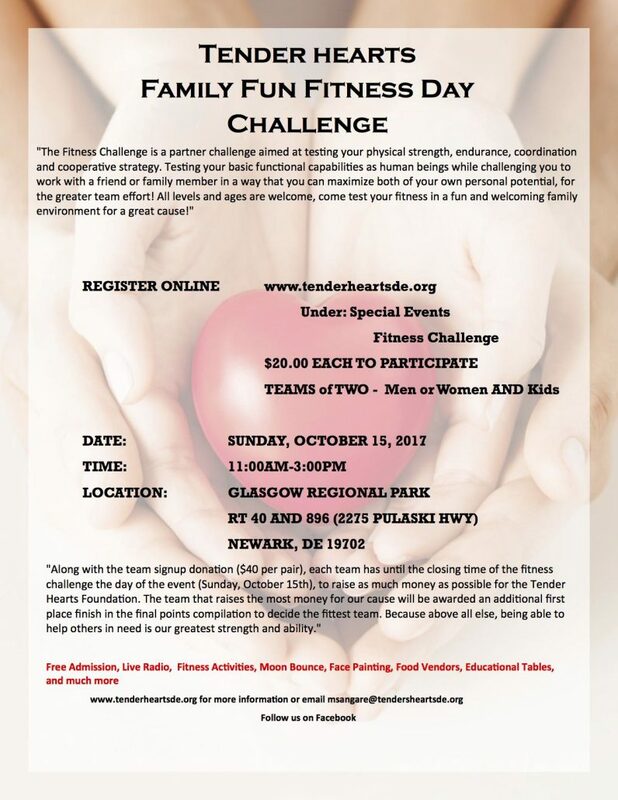 Along with the team signup donation ($40 per pair), each team has until the closing time of the fitness challenge the day of the event (Sunday, October 15th), to raise as much money as possible for the Tender Hearts Foundation. The team that raises the most money for our cause will be awarded an additional first place finish in the final points compilation to decide the fittest team. Because above all else, being able to help others in need is our greatest strength and ability. We also want to mention that this event will be benefiting Preston! Preston was diagnosis with Mitochondrial Disease, which leaves him with low muscle tone, and developmental delays. During the summer of 2011, Preston was blessed with a adapted bike donated to him through a fundraiser. The Buenaga family decided to “Paying It Forward One Bike At A Time” created an organization called Preston’s March For Energy. This organization provides adaptive bikes to children with special needs and promote adaptive activities for all children to be included. With the proceeds from this event, Tender Hearts has decided to donate 3 adaptive recreational bikes and will present them to the children that resides in Delaware.